music. It is a great, hands-free way to interact with the app. Other updates for this release include Lock screen integration so you can see the music station you are playing on it, recommended station based on your listening choices and significantly improved sharing of your Pandora stations with others. There is also a new sleep timer which will allow you to go to sleep to your Pandora station and it will automatically shut down after the timer expires. If you like to stream your music and haven’t tried Pandora for Windows Phone or haven’t tried it in a while, I would suggest to have a look. It is an app that feature wise is on par with other platforms but has some unique Windows Phone only features such as being able to pin your favorite stations to your Start screen and it has Live tile support. 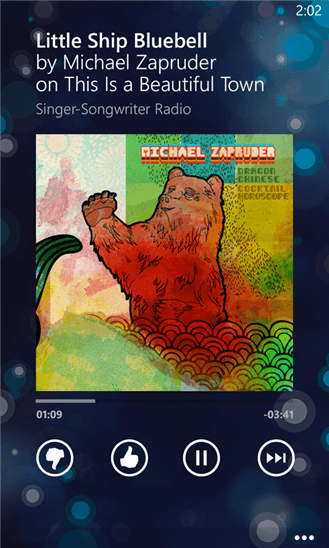 Pandora for Windows Phone is free and the service is free as well. You can sign up for Pandora One for $4.99 per month which will give you higher quality audio and will eliminate the ad supported element of the app.